Habitat: Common Polypody is native to Europe. It can be found on cliffs, cracks in rocks, on sandy soils and shaded to semi-shaded areas. 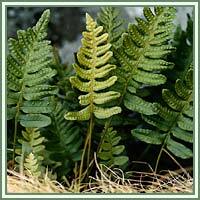 Description: The Common Polypody is a fern developing from a long, scaly rhizome. It has pinnate and lanceolate-oblong leaves. They are dark-green and hairy on their upper surface, and light-green and hairless underneath, tapering to a pointed tip. Leaflets are entirely or shallowly toothed, becoming shorter as they approach the tip. Spores are produced in spherical dot-like clusters on the undersides of the leaves. Period of sporulation lasts from July to September. 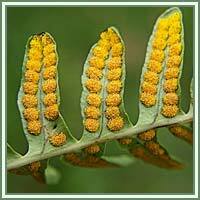 Medicinal use: Common Polypody has demulcent, diuretic, expectorant, laxative, purgative and anthelmintic properties. Traditionally, the plant was used in treatment of pulmonary and hepatic ailments. It was used as a remedy against hepatitis, jaundice, indigestion and loss of appetite. A herbal tea made from the roots is very beneficial in treatments of stomach aches, pleurisy, hives and sore throats. It is also recommended for spleen and liver disorders. In form of a poultice, Common Polypody is an excellent agent in cases of inflammations. Safety: External use of Common Polypody could cause skin rashes. Always consult your doctor/herbalist before consumption of any herb.